Having recently caught up with Corey King last week with the release of the Lashes album via Ropeadope, the artist recently release the Ryosuke Tanzawa video for “Ibaraki” that features the artist taking a walk with his feeling and thoughts. King’s understated melodic howls & murmured whisper delivery is reinforced with the strong team of guitarist Matt Stevens & a rhythm section that counts Alan Hampton, Jamire Williams & more. Keep an ear & eye out for more coming soon from Corey King. Introducing Teen Brains who present the thrills, chills & plenty of awesome attitude that abounds on the Translucent EP available now in the UK from Witchgirl Recordings and stateside via Citrus City Records. The fun begins on the infectious blaze of “In A Haze”, the solace of “Isolation”, the post-punk goth-makeup smears heard on “Wash Away” and finally closing with the title track that could have been a rarity from Weekend that shines with a hazel light. Keep an ear out for more from this group on the rise. From the man that needs little to no introduction, we present you with K Records legend Calvin Johnson & his outfit Selector Dub Narcotic who just released the album This Party Is Just Getting Started today. Kicking it classic & cool on “Hotter Than Hot”, he gives James Murphy’s LCD Soundsystem pop project a run for the money running through the novelty tropes & triggers on the vintage roller “Baby’s Got Oi”, the interlude of “All Thumbs”, the regal desires & wants of “I Need Sum”, to the word play fun & bounce of “The Party’s Over”. The long awaited follow-up is the sound of Johnson just having himself a grand ol’ time on song sketches like “What The…”, the dreamy dance haze of “Carry The Sun”, the dorky emcee expressions on “All For The Sake of Rhymin”, a melodica beat interlude on “Recreational Ironing”, right before the lover’s dance stepping “Let’s Spend Some Time Together”. Calvin raises the roof on “And Stuff Like That There”, to the solitude shuffle of “Lonely Planet Puss N’ Boots”, the twirling “Docu Drama interlude” that then closes out the album (but not necessarily the party) with “Every Woman” that leaves you with the eternal valentine recitation of “every woman is beautiful”. Fascinations Grand Chorus bring us more from their own wonderful world of fascination with the video for “Welcome” from Kelli McGuire & Eric Durkin that delivers throwback images of swinging shindigs. Utilizing various color filters, a barrage of really fun classic styles & a whole lotta high spirits; Fascinations Grand Chorus continue to keep everything they love about the 60s alive in both their sound & visuals. HODAD’s new cassette is available now via Odd Box Records, and we give you an enthusiastic & energetic listen to the Cardiff scuzz-busters now. A new band that emerged earlier this past January, the group emulates the action of the stateside western coasts (with nods to the southern legions of skronk) heard in their constant vortex of monster surf wave mayhem that begins with tidal storm destroyer “Sunny d?”, sandstorm kickers on “HODAD’s Day At The Beach”, the red patent “real leather”, the romance of “Vera <3”, closing out & closing in on “THE BEST WAY OF LIFE”. Kingston, NYC’s Shana Falana dropped the single “Lie 2 Me” ahead of the forthcoming album Here Comes The Wave October 21 from Team Love Records. The pop art drone duo pull out all the distorted & echo-entrenched stops on “Lie 2 Me” that rips up all those unspeakable sentiments that are felt & experienced in the absence and/or compromise of trust. 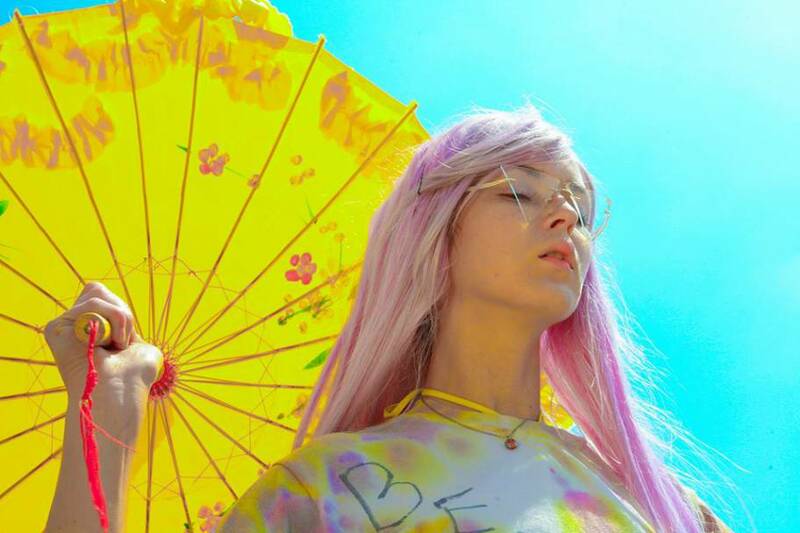 Rising pop vocalist RAINE dropped her title track from her forthcoming My Dreams EP that enters the soothsaying realms of the dream world. “My Dreams” entertains the recalled experiences of exchanges with individuals from dream land who continue to have a lasting effect and hold on our artist who pronounces the characters & stories like sung passages from a dream journal. Lose yourself in the illustrious beauty heard via “On Course” from C Duncan’s upcoming album The Midnight Sun available October 7 from the discerning palettes over at Fat Cat Records. “On Course” is the sound of sorting out all the particulars of the day-to-day that also considers the various emotions that are often never recalled, considered, or accounted for. Let your burdens be lifted, if not levitated immediately upon first listen. Following their DOSE EP, San Diego’s Zenxienz brought the ambient world shifting atmospheres and arenas of feeling & sound with “The Great Beyond” ft. Swinky. Kauai by LA artist Cameron Williamson collaborates with the Kenyan vocalist to create the sound of venturing into that ineffable ether of the unknown & much mythologized dimensions. Surface To Air Missive’s album A V wil be available November 4 from LEAVING and you can enjoy the moment embracing video for the pop art brilliance of “Time Being”. Tallahassee by Athens, Georgia’s Taylor Ross makes music that rings in a similar DIY chord to similar southern spirits like Caroline Says where the shimmering sound of 60s nuggets are rearranged & refurbished for a whole new era of understanding & urges centered around cults of entertainment. NYC’s Dalton Deschain & The Traveling Show dropped the fright show single “Freakshow” featured off their forthcoming Roberta EP available October 28. A collective of traveling oddballs that has been around since 1947, “Freakshow” keeps the showcase of bizarre creatures proudly presented on display from monsters to mermaids from hell. Luke Temple sent word of his new album A Hand Through The Cellar Door available November 11 from Secretly Canadian lending the rustic & rural song of heart to prep for the long winter season with the sentimental strumming “The Birds Of Late December”. Hear Mat Shoare’s “Scandal” from his upcoming album Waking Up Is Hard To Do available November 4. The Kansas City, MO artist taps into the classic Beatle-beat approaches to holistic power pop where all intentions & vulnerabilities are stitched on the sleeve with honesty & a host of harmonic hooks. For those seeking rich pop vocal hits, check out Belinda Esquer’s single that asks when you “Look Inside”, what do you see? Found off the album The Truth available October 28, Belinda’s music is cut from the contemporary pop model like FRAME & other artists who move the spotlight back on the vocalist above all else. Portland, Oregon’s James Wolfglen shared the title track “Bombay Sapphire” off the EP of the same name available September 30 that recalls war stories, battles with alcoholism & blues relived from the back pages of personal histories & testimonials. Most People present their Seth Mendelson video for “Telephone” that showcases women’s backyard wrestling done at night illuminated by headlights. Paper-mache masked folks look on while high stakes & big pressure is all placed on the line to MP’s super catchy collection of synths. Watch the Kevin Freeny video for Chuck Westmoreland’s “The Clouds Beyond Us Carry Rain” starring Stephanie Woods & a whole lotta backwoods weirdness set to acoustic strums. Brazilian artist Lucas de Almeida currently stationed in Bergen, Norwway presents “Risen” available now via Brilliance Records. Lucas follows up recent tracks “Florahedron” & “Cerulean” with wavy wonders of an alternate summer experienced at some mythical far-away beach left in the deep crevices of either memory or in the unfulfilled fantasies & longings for a truly blissful holiday. Lost Animal readies the new album You Yang available October 21 through Captured Tracks/Remote Control Records presenting the world with the visuals for “Do The Jerk”. Taking cues from cult heroes past & present, Lost Animal flips derelict attitudes with a smart arsenal of carefully designed dischord that has closely listening & watching for what they’ll do next. From Boston, meet Dyr Faser with their new Trio EP available October 14 and we give you the following advance listen to their electrified eccentric brews. “Den of Sables” kicks off the action like a tribute to the fallen idol Alan Vega & Suicide, with “Estranged” taking you deeper into the psychedelic stratospheres, while “Don’t” brings about new uplifting realizations. “Just a Face” continues the desert wobble & wander, while “Kōsō Biru” keeps the chords cooking with purpose, before everything arrives at a boil with “Hybrid Souls”. Mt. Wolf shared the ambient strumming single “Golden featuring St. South that brought about waking lyrics & rhythms to greet the shine of a brand new rising day. “Golden” embraces harmonies that blaze with the might & brightness of the morning sun the deliver a sense of calm surrender to all stressed souls with ears to ear. M. Lockwood Porter shared the tales of big dreams & even larger obstacles on “American Dreams Denied” that rings in the disillusionment with pure rocking cheer off the upcoming album How to Dream Again available September 15 from Black Mesa Records. Rome, Italy’s Weird. released the following video teaser for their forthcoming mysterious, elusive yet alluring new single “F F F”. Seen touring recently with Veldt and touring through September 25 independently, the group channels those alternate chords that echo from the deepest reaches and reverberation of our being. Also behold the Lorenzo Musto and Erica Terenzi video for Weird.’s “Infinite Decay” that leads you out to bizarre tethered outings to a rather dreamy and soothing soundtrack. Alu shared her vintage video collage for title track “Mrs. Hypochondriac” featured off the upcoming album of the same name available October 14. The visage of Alu appears amid an edited collage of public domain images sourced from the Prelinger Archives, National Archives & The Library of Congress that delivers a bedtime stories & lullaby for those that battle the continuum between sickness & health & everything in between. LA’s Low Leaf delivers you daily dose of heady & heart penned meditations with “Pupil of the Universe” found off the upcoming album Palm Psalms: A Light to Resolve All Darkness available October 15 from her label Creator DIY. Drawing upon inspiration from the upbeat Psalm 57:8, LL utilizes ancient verse & tractates to springboard into the cosmos to inquire Solomon level wisdom from the universe. Get into the “let’s get it, let’s go right now, now, now” spirit with Bodega Brovas’s Teddy Cool video of straight up revelry & celebratory vibes for “Vices” ft. Nice & Smooth’s Greg Nice, found off the Brovas’s album L.G.A. (Loaded Guns & Alcohol) available now. Counting out all the collected desires & bad habits & mixing it all up into one volatile cocktail; the BBs bring about the the liveliest soiree you could imagine. Canada’s Kestrels presents the virtue of patience in a perfectly neat pop song with “Waiting”, found off the forthcoming self-titled album available September 30 from Sonic Unyon. Every chord, melodic ounce of sound, hooks & more pour forth like a whirling electric top of fun where a very raw (almost live) feel is intact while alluding to their own dreamier affinities. matches the absolutely massive & ambitious nature of the power & might of “Choir VI”. Brooklyn’s All Boy/All Girl provided some choral arrangements for pause & thought with “Pastels” from their upcoming album Slagroom available October 21 on Grind Select. The result is a combination of rhythmic strings that sway you into the arms of bliss as is to save you from what be an otherwise humdrum day. Brooklyn fave Drew Lustman, oka FaltyDL recently sent news of the new album Heaven is for Quitters available October 21 from Blueberry Records and shares the James Lowrey video for “Drugs” ft. Rosie Lowe. Privy peaks from hidden & sometimes faraway vantage points focus on their subjects that are respectively & individually enjoying their own moment & trip. Electro LA cult pop icons Danny & Tiffany Preston, aka Rainbow Arabia return with news of their first album in three years with LA Heartbreak available November 11 from Time No Place/Kompakt. With the first listen unveiled via “I’m Over You”, the synths have gotten colder & a little sharper as the group’s motherboard-metropolis aesthetics are entertained in an economy of synths that are structured like modern freeway design & architecture (and created to be enjoyed especially during those late night lonely drives). Conner Youngblood presented the single “Sulphur Springs” that follows up the reissuing of his Generation of Lift EP from Counter Records. “Sulphur Springs” rocks calmly & steadily on a minimalist electro drum loop where Conner gives a passionate & expressive delivery relayed through evocative auto-tuned filters. Alessandro Degli Angioli directed M+A’s “Forever More”, the first follow-up single to the Italo duo’s Anyway Milkyway EP that takes all impulses & intimations of amour into the underwater deep-end. Having just explored insights from Jaakko Aukusti on the forthcoming visuals, we give you a listen to the single “Oasis” that will bring you to that special desert island of choice with all kinds of electro jubilation. The thoughts & feels of better days are expressed through a plethora of electrified vibes that will keep your summer shining bright into the dawn of the autumn. Shabaka and the Ancestors’ album Wisdom of Elders is available today from Gilles Peterson’s Brownswood Recordings and you are invited to enter the chambers & galleries of infinity with the heavy instrumentation heard on “Natty”. Mark de Clive-Lowe is here to get your weeekend started with the following listen to #bluenoteremixed Vol. 1 that fuses rhythm, blues, hip hop & the fusions of jazz of future sub-genres & tags that haven’t been made up yet. Introducing the latest electro pop darlings PitchSlap who gifted us with the new single “New Heart” feat. Melody Federer that presents a more emotive approach to your run of the mill EDM blues & digital rhythms. Performing October 21 at The Study in LA, the duo Lacei shared “Cold Moon” that shares icy, cosmic vibes & intimate recollections featured off their forthcoming debut EP. France’s Peter Cristofle & Hary Haja are Bastion who present a listen to their electro-dance pop pomp & circumstance with the Crystal EP. The two continue to the lineages birthed by Daft Punk & J.U.S.T.I.C.E. & others that provide a chic Franco flare to the snazziest dance tropes imaginable. Katie Burden just released her album Strange Moon today from Cautionary Tail Records/Manimal Label Group and we present you a listen to the title track. Burden creates the sound, effect & narrative of a world wandering desperado who makes her way across the universe by the arrangement & dial of the stars & their corresponding constellations that bring their own compasses that traverse through the multi-dimensional suites that Katie has arranged with the following adventure. Accompanying Tom Krell, aka How To Dress Well on his international tour kicking off this month, introduce yourself to Ex Reyes, oka Mikey Hart, via the single “Only You”. Expressions on the level of e.s.p. & the like are conveyed through an expression arrangement that is exchanged through canals of sound. Those listening for some romantic chamber moods, we reccommend AM!R’s FUTUREPUNKSOUL EP that takes you through all the dance floor motions with the expressive exchanges of “Dirty Whispers”, the human “Bones”, the fancy “Design”, the pensive “Parachute”, the communication captured on “Not Tonight” & more to get your infinite weekend playlist started. Gabriella Cohen’s album debut Full Closure and No Details will be available October 14 through Dot Dash/Captured Tracks and today we present her latest single “Sever the Walls” that breaks down the barriers & blockades that divide. Spinning off the sentiments & audio experimentation of grandiose concept pop records from the 60s & 70s, “Sever” illustrates the wild paintings of sound that Gabriella conveys from abstract idea to full scale realization.